Most virtual teams are organized for cut and paste work, or what I like to call quilting. Each team member creates a part of the project—sometimes simultaneously, sometimes sequentially—and the parts are sewn together. Each person operates independently, performance evaluations are based solely on individual work, and meetings are opportunities to share progress reports. This is a simple form of teamwork that is well suited for routine projects. But this team structure will not create innovation, the sharing of best practices, or the competitive advantage that can occur when you bring people together to work toward a common goal. The best teams don’t quilt, they weave. Each individual’s contribution is woven together with the contributions of others, strand by strand. The end result doesn’t resemble any one individual but instead creates a new pattern—a tapestry of innovation. Quilting and weaving are both valuable ways to create results—but if you want to innovate or implement best practices, weaving is what you need. Here are five tips to move your team in that direction. Be clear about the group’s vision. Clarify which aspects of project work are independent and which require the collaboration and innovation unleashed through teamwork. Set clear expectations so individuals know how to be successful. Stop rewarding solo acts. Individuals naturally align to the measures of performance they are held accountable for. If you want people to innovate or implement process improvements, measure and reward collaboration and innovation. Build a safe place to share incomplete ideas. Build team time for brainstorming, the sharing of ideas, and “what if” thinking, safe from criticism or sarcasm. If you push for quantity of initial ideas, quality usually improves as well. Implement team practices to encourage healthy conflict. Partner team members based on diversity. Ask individuals with diverse backgrounds, expertise, and cultures to work together to pressure-test ideas or work on small tasks together. This reinforces respect for diversity and pushes everyone to think differently. Diversity raises the collective intelligence of teams. Help team members get to know each other. Innovative teams usually know and like each other. Use team directories to facilitate the sharing of personal photos and ideas for hobbies and holiday practices to foster trusting relationships built on personal knowledge and shared experiences. 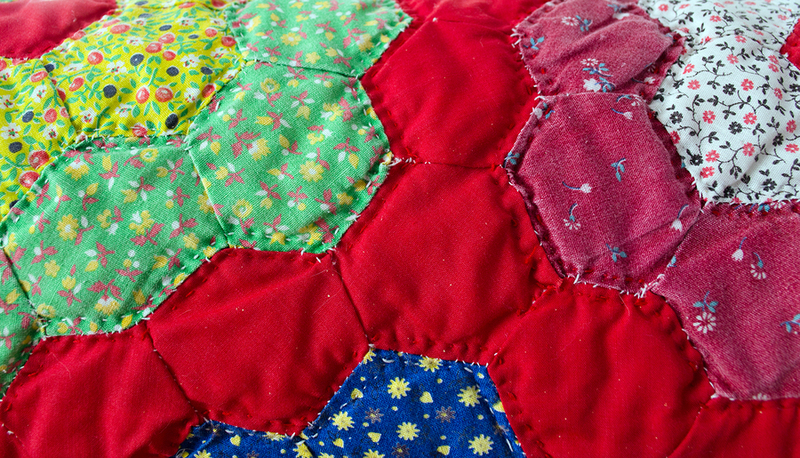 For routine, low-impact projects, quilting can be a good enough structure for getting the job done. Just don’t fall into the habit of using a quilting technique when you need something more. If you want innovation, process improvement, or new creative solutions, you must move beyond the limitations inherent in a quilting approach to virtual teamwork. Instead, weave ideas, skills, and talents together with a truly collaborative and co-designed approach. Quilts are nice and comfortable, but for truly innovative solutions, weave a collaborative tapestry instead! Hi Andrew–thanks for your comment–you should be able to use the social media buttons at the end of the post–if not, let me know.